▲ Campus wall poster written by People to People. Provided by People to People official Facebook page. 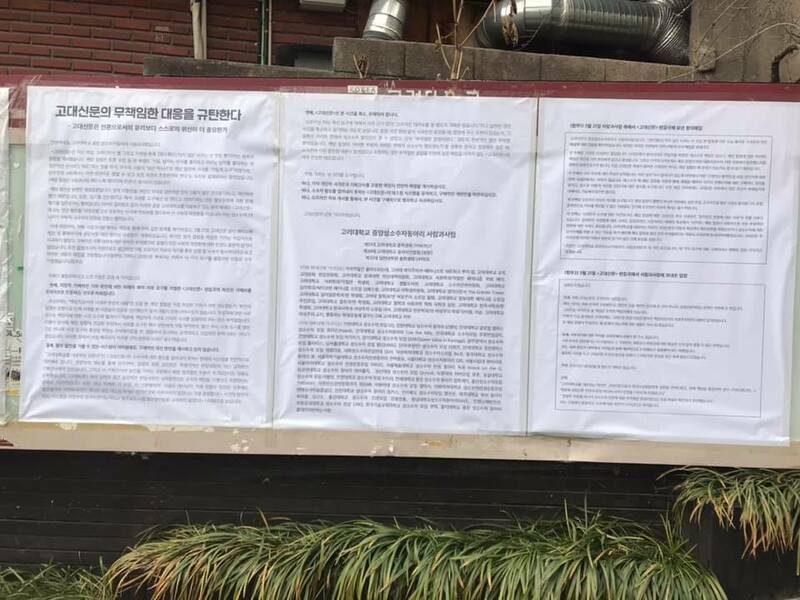 On March 18, The Korea University Weekly (KU Weekly) posted an article that seemed to support queerphobic comments under the name of freedom of speech. As a response to this article, on March 21, People to People (P2P) posted a campus wall poster criticizing KU Weekly, requiring an apology for their irresponsible choice to publicize such periodical. In the column, the reporter writes about his past experience engaging in an in-class debate. During the debate, a student stated that “it is ordinary for men to like women and women to like men.” and was met with several other students requiring the speaker to apologize for such hate speech. In the end of the article, the reporter asserted that in this democratic society, everyone has freedom show their thoughts and claimed that demanding one to apologize may appear oppressive. P2P pointed out that the article could neglect the situations that the LGBTQ (Lesbian, Gay, Bisexual, Transgender, Queer) currently face, and showed great disappointment at how KU Weekly is attempting to only minimize the situation without a clear apology or a solution. Thereby, P2P required an apology from the reporter himself, and explained the need to propose a specific solution for this incident. They are requesting for a campus wall poster that includes a detailed explanation of the incident including why it is problematic, and disclosure of the current gatekeeping system that apparently failed to censor inappropriate content. To aggravate the situation, the assistant administrator of KU Weekly has suspended all the reporters in the Editorial Department just when they were trying to put up the wall poster, because they “gave in to external pressure, damaging the journalistic spirit.” Therefore, the reporters now cannot post an offline-apology by KU Weekly Editorial Department, and are now looking for other ways to resolve this issue. P2P has not received an acceptable apology or responses to other requirements, and the issue is yet to be solved.